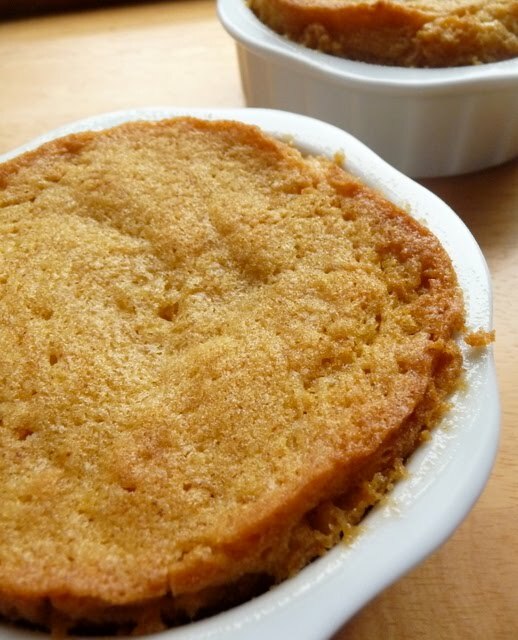 I ended up making one quarter of the original recipe for the brown butter pound cake – and it fit perfectly into two small crème brulee cups. Then I used two small pyrex cups to portion the ice cream – which fit perfectly on top of the cakes! 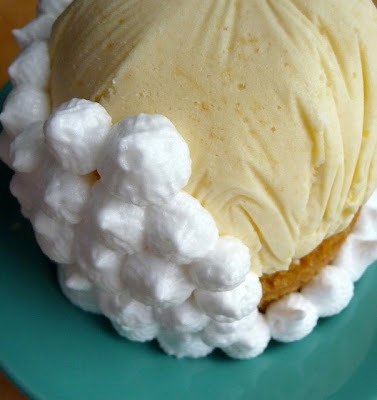 I also used my favorite ingredient – peaches – in the ice cream. I used Dorie Greenspans honey peach ice cream recipe (which is so good that it deserves its own post – so that recipe is coming soon!). The honey/peach flavor really complimented the nutty, brown-butter pound cake. 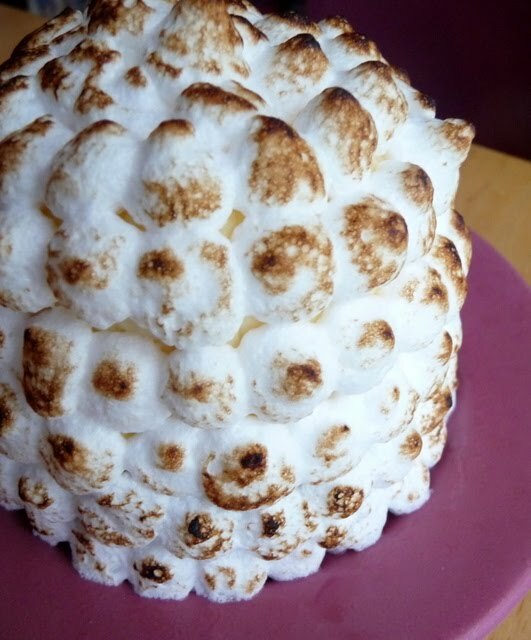 And the toasted meringue on the baked alaska was the perfect topping. Such a fun challenge – I can’t wait to see what is next! 1. Preheat the oven to 325°F and put a rack in the center. Butter and flour a 9”x9” square pan. 2. Place the butter in a 10” skillet over medium heat. Brown the butter until the milk solids are a dark chocolate brown and the butter smells nutty. (Don’t take your eyes off the butter in case it burns.) Pour into a shallow bowl and chill in the freezer until just congealed, 15-30 minutes. 6. Scrape the batter into the greased and floured 9”x9” square pan. Smooth the top with a rubber spatula and rap the pan on the counter. Bake until golden brown on top and when a toothpick inserted into the center comes out clean, about 25 minutes. 1. 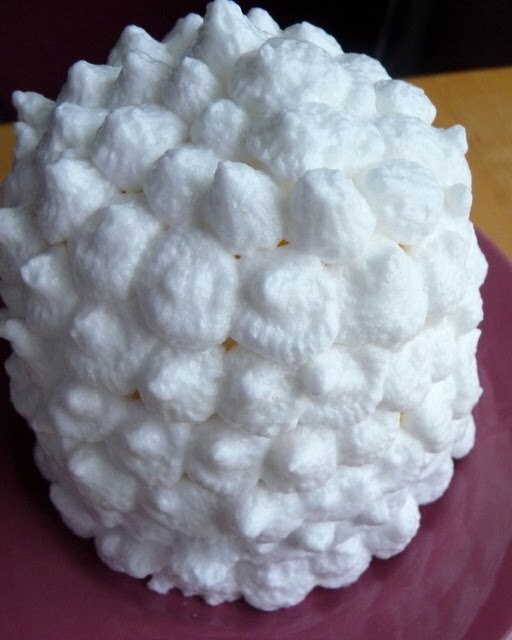 Beat the egg whites, cream of tartar, and salt on high speed in an electric mixer until soft peaks form. 2. Beat in the sugar gradually in a slow stream until stiff peaks form. 1. Line four 4” diameter tea cups with plastic wrap, so that plastic wrap covers all the sides and hangs over the edge. Fill to the top with ice cream (use any flavor ice cream that your heart desires!). Cover the top with the overhanging plastic wrap and freeze for several hours, or until solid. 2. Level the top of the brown butter pound cake with a serrated knife or with a cake leveler. Cut out four 4” diameter circles from the cake. Discard the scraps or use for another purpose. 6. Burn the tips of the meringue with a cooking blow torch. 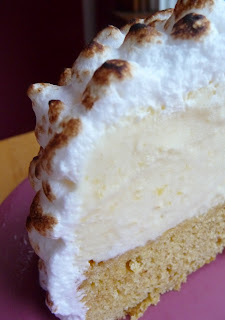 Or, bake the meringue-topped Baked Alaskas on a rimmed baking sheet in a 500°F oven for 5 minutes until lightly golden. Serve immediately. Thanks Elissa of 17 and Baking for the great challenge this month! And check out the Daring Bakers blogroll to see how everyone else did! Ooohh... honey peach ice cream sounds fantastic. And your Baked Alaska looks amazing! Really great job on the challenge. That peach ice cream is just beautiful...such a subtle peach color. I bet it was delicious! That is very beautiful. You should be so proud!